1) Identify the “sandwich generationers” you cross paths with. The first step in supporting caregivers is to take the time to consider who they are. Caregivers, because of the limited time they have in other people’s lives, may not necessarily explain the extent of their caregiving role. After a certain point in time, the caregiving role may be so ingrained as part of the caregiver’s life that people outside the home don’t even recognize them as caregivers unless the topic naturally came up in conversation. Bring it up next time in conversations and certain people may come out of the woodwork to speak about what they may have gone through in the past, are about to go through or are currently experiencing. 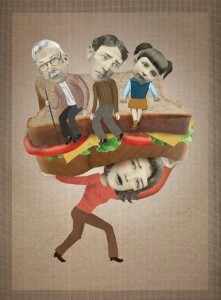 2) Be supportive of the tough choices the “sandwich generationer” makes for themselves and their family. No matter what anyone may think they know, the truth is every person’s situation is different. The caregiver and their family members will be the ones who will live with the choices , so it is not in the best interest of the caregiver or their family to promote the choices others may believe to be wiser. It is helpful to provide feedback, offer another pair of eyes, share ones own applicable experiences and serve as a person to bounce ideas off of, but once the caregiver makes a decision, be supportive of it. There are reasons why not everyone is consulted in a decision making process. Chances are there may be aspects of a decision the caregiver believes most cannot fully relate to. Understand also that there may be a whole side of the situation that you simply don’t know about. “Sandwich generation” TCK’s or expats especially need the support of other global nomads who can relate to issues of unresolved grief or other issues distinct to a globally mobile childhood or lifestyle. 3) Be personally available to a “sandwich generation” caregiver who may want to share some of their stressful experiences as a way to show they do not have to go through them alone. Sometimes listening goes a long way. You don’t have to give advice, especially if you have not been in similar shoes. Just listen and if you feel it would be welcome, encourage a caregiver to open up about how they are doing beyond the “I’m fine, thank you” answers. Offer genuine attention and time. Chances are, if you see them for some periods outside the home, the rest of their day or week are probably spent mostly at home. A nice chat over lunch or a quick one-on-one catch up session to the side of a larger gathering or event helps to reassure a caregiver that someone is there to listen. If you believe that the caregiver may benefit more from counseling, there are counseling resources available for the expat or TCK caregiver (a page will be added in the near future for such resources upon further research for caregivers with limited income). However, don’t assume that if you do not offer this help, the caregiver will be fine or that they will go out of their way to reach out to you. 4) Be careful not to judge or minimize. This journey is one of the toughest journeys a person can experience in a lifetime for the reasons mentioned above (which touches on just some of challenges). Each person’s journey is different. While certain aspects of a caregiver’s situation may be similar to another caregiver’s, the entire journey of a person is not the same as another’s. The context of the timing, family dynamics, circle of support, ability to share tasks with siblings or a spouse, individual need to maintain a career, place in life and many other factors a caregiver is dealing with is never exactly the same as another caregiver’s. The extent and type of dependency a loved one has on a caregiver can also be extremely different in each situation, as are the financial and other resources available to the family. Take time to see things from the caregiver’s point of view, and be quicker to find out more before suggesting solutions. Efforts to “help” others are not effective if they do not address where they are truly at. See the caregiver as the expert in their own lives (unless for example, by a professional’s judgement, the person’s “actions or potential actions pose a serious, foreseeable, and imminent risk to themselves or others,” a standard in social work practice). If anyone can take the time to think or say to themselves that other people in the caregiver’s shoes were able to do something differently, they can take the time to speak more to the caregiver and find out why things don’t look the same. Most importantly, when a caregiver opens up, remember two things – a) believe them the first time and b) treat the trust a caregiver has in confiding in you with utmost respect. 5) Understand that the “sandwich generation” role cannot be compartmentalized. The “sandwich generation” role touches every aspect of a caregiver’s life. Even though the situation that brought on the dual caregiving role may have come suddenly and has a clear beginning, the end may not be clear or predictable. The boundary of its impact on the caregiver’s life is not rigid. A caregiver’s entire life is impacted: Everything from income, to eating patterns, to self-grooming (ie. the distinction between a luxury and a necessity), to sleeping habits, to friendships, to the marriage relationship or dating patterns, to the upkeep of a house, to the competitive edge in the work setting can be affected. A caregiver needs to take breaks and have distance sometimes to care for themselves so they can be of use to others. 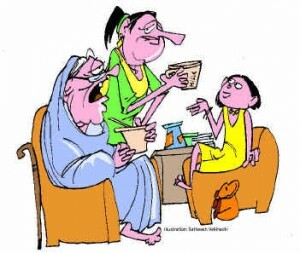 However caregiving is not a responsibility one can really set a clear boundary around the way one would with a 9-5 job. Caregiving requires more flexibilty and even when the caregiver’s role shifts in some major way, their role does not really cease. 6) Offer help. This is especially for the single parent caregivers. Whether one feels qualified or not to help with certain things, offer help where you can. It may not be obvious what a caregiver needs help with until someone asks. Offer help in a way the caregiver will understand the offer to be genuine. Some may be hesitant to ask for fear of not being able to return a favor. Practical things a “sandwich generation” caregiver can get help with include: getting groceries (of their choice), maintaining a yard, help with fixing house repairs (plumbing or other leaks, electrical wiring, etc. ), car repairs or maintenance, errands, etc. Those with a professional skill, such as carpentry or construction, plumbing, or electrical engineering, or who are lawyers, doctors, social workers, hospice workers, nurses or physical therapists can offer their professional services at a significant discount or for free in recognition of the great hardships of “sandwich generation” caregivers. I may not be able to convince a reader not already inclined to help others to change their mind, but I will share this: Certain situations don’t have an easy way out and the only reason why certain caregivers are in certain situations is because they chose to brave out the journey and are the only ones around to take responsibility for it. People who take this level of responsibility deserve help simply because no human being should go through the toughest human experiences alone. 7) Expect nothing in return. Caregivers, especially “sandwich generationers,” may not be in the best position to be as reciprocal as they may have been at a different period in their life or otherwise would be. Caregivers cherish the support they receive even when a caregiver who may not be able to demonstrate it by spending time with friends or returning a favor. The caregiver may not have the luxury of time or money to always reciprocate. “Sandwich generation” caregivers have to stretch out their resources and time to cover things the average person doesn’t have to budget into their finances or fit into their regular schedule. For some, this may be hard to hear, but certain favors or gifts may not be reciprocated until the caregiver is in a better position. This is one factor that can actually lead to a caregiver’s isolation: friends can start to dwindle because caregivers simply aren’t around enough or are able to reciprocate. TCK or expat caregivers may not even have any friends who are more than acquaintances of casual friends to turn to for help. Look out for them, even when they aren’t a particularly close friend. This is simply a personal choice that takes a special heart. For my readers who help “sandwich generation” caregivers and don’t expect anything in return, know you are serving an army of brave soldiers that face the toughest battles but don’t get enough recognition, special treatment or, especially in the case of expat or TCK caregivers, may not have the support of a “home country” that can provide a safety net for their own future aging. Thank you! 8) Assess your work colleague’s credibility with fairness if your colleague is a “sandwich generation” caregiver. As explained in #5, the caregiving role affects all aspects of a person’s life. In work relationships, try to translate how the caregiving responsibilities of a person can affect how competitive they can be in comparison to others who more frequently go beyond the extra mile, do things outside their job description or are more flexible. If a work setting provides the option to work remotely or online, provide ways the caregiver working from home can demonstrate their reliability pertinent to their job role. Don’t limit such opportunities to colleagues who can be physically present or travel more. Perhaps the majority of people at a given work setting have families and responsibilities as well, but remember “sandwich generation” caregivers take on much more than the average head of household. The credibility or value of a work colleague or employee must include the commitment they demonstrate as a whole person, the bigger picture of their past accomplishments, the quality of their work vs the quantity of times they can be physically present at events, and the skills required not only in practicing their profession, but also managing their time so they can fulfill their duties yet juggle other demanding responsibilities. 9) Recognize the single parent “sandwich generation” caregivers. For every point I make here, remember that there are single parents going through everything I have explained but work with one income and do not have the option of staying at home while a spouse works to make sure the bills are paid. It is a very difficult journey that requires a level of extreme vigilance to take on this role. Words are simply not enough to paint the full picture of what single parents in this role go through daily. Paying the bills on time, making sure any leaks or repairs needed in the house are taken care of, ensuring the car continues to run smoothly, staying on top of doctor appointments and healthy diets for the whole household, and other standard household maintenance tasks, as well as the intricate duties related to caregiving, paying attention to the educational, psychosocial development and other needs of the single parent’s child(ren) AND the overall wellbeing of her/his aging parents must all be accomplished with the budget of a single income earner. This is not to mention their own needs, including the reality of the necessity to plan for their own aging and retirement. This is just one side of the picture. The single parent in this role must also be able to independently manage the logistics of all of the above in the same amount of time everyone else has, while working to bring in income and doing everything else the average person needs do to for her/his career. Most employers assign a single type of job role with related duties according to a reasonable work load per employer. If you picture all the responsibilities of a single parent in a “sandwich generation” caregiving role, it would look like one person operating, managing or supervising all departments of an entire company for a customer base representing three demographics – unpaid for all of the above. On top of all of this, the single parent in this role does not have the emotional support a spouse can otherwise provide. A TCK single parent in this role has an even greater need for emotional support, especially if they start to come to terms with the unresolved grief of their past in different ways through this role. In an environment that may be void of TCK support or understanding, it can be overwhelming for the TCK single parent who is a “sandwich generation” caregiver. 10) Respect the journey of the family. Those who are in the position to be personal friends of a caregiver must be understanding when there are occasional family tensions. Conflict is a normal part of any group setting that forms and develops. It is understandable that with a family experiencing significant life changes affecting three generations of family members simultaneously, especially under the same roof, certain tensions will come. In a supportive environment, these tensions will eventually go. This journey involves different seasons and none of them make a family less worthy of support. One year, a caregiver may need to quit a job or live with the loved one they are caring for. Another year, the caregiver may need to prioritize obtaining a certain job or may need to live separately for one reason or another. Respecting this journey and the various seasons is to remember that all the family members are just human, have intrinsic human worth and individually deserve to be treated with dignity. It is truly one of the toughest periods for the elderly persons, the child(ren) in the household and the caregiver(s), and they are all in it out of love for one another. Please click here for more information about why this blog was started. © Myra Dumapias and The Last Boarding Call, 2014-2018. Unauthorized use and/or duplication of this material without express and written permission from this blog’s author is strictly prohibited. Excerpts and links may be used, provided that full and clear credit is given to Myra Dumapias and The Last Boarding Call with appropriate and specific direction to the original content.